Showing results for tags 'delta'. I have a good quality 11 foot keeled delta. I have flown it many times in extremely light winds, nursing it up by careful line management. I have also flown it in strong enough winds that I have struggled to bring it back down. I thought I was familiar with it in all its many moods. Today, I was trying to get it to fly in a very fitful teasing breeze. The wind was so weak that I couldn't be quite sure which way it was coming from. I threw tufts of grass in the air and they fell vertically. However, I could see some rustling in the leaves at the top of the nearby trees, so I knew there was something up there if only I could hook it. I therefore went for a long line launch and after several attempts, the kite started to pull reasonably strongly and I was feeding out line carefully and getting some decent height. Within a few minutes, I had it a hundred metres or more up and it was flying at a slightly lower angle than usual. Then suddenly it started to pull and climb, and after a minute or two it was exactly vertically overhead. It was not in a glide (I've had that before) but it was actually pulling. I then realised that it had gone slightly beyond directly overhead - it was slightly behind me. The line was going up in front of me, then curving BACK towards the kite and the kite was still pulling - not hard, but definitely trying to take line and go higher. For the first time in a long time, I found myself worried about something going dangerously wrong. I estimate I had 100 - 150 metres of line out, and I was less than that distance from a road in one direction and houses in another direction. In theory, these were both safely behind me and "up wind" but the kite seemed determined to go that way. To reduce the risk, I walked steadily away from the hazards. The kite continued to pull and remained almost exactly overhead, but sometimes changing its direction of heading. A couple of minutes later, the moment had passed. The wind had dropped and the line was sagging down to a less spectacular angle. I have had a kite glide and over-fly before, but this was not gliding it was pulling. I wondered about thermals, but I was in a grassy field and there were no areas of tarmac, concrete, water, roofs, etc. that might have caused a strong updraft. Has anyone come across this before? Any suggestions? I like to think of myself as an experienced kite flier, but this was outside my experience. Hey Y'all, it's time to let some go. We have twins due in September and not enough house for them and all my hobbies. I guess I'll give priority to the babies. Anyhow, these look like the ones that don't make the cut. Prism Tensor 3.1 has been flown once. Has dye marks on the back of the sail, apparently from the lines, but is 100% functional. $250 SOLD Prism Micron 5 Stack x2) As far as I can tell the sails are identical. One set has ripstop tails, the other has plastic tails. $175 each. $300 for the pair Gomberg Super Sled (Yellow/Black), pennant tail, 2 transition tails, ITW 11' Squid, 200'x200# line and sand anchor, 2 spiral worms. $150 Prism Stylus 2.8) I don't remember if I've ever had this one up in the air. No lines $75 HQ DeltaHawk, I've not flown this DeltaHawk yet. I was planning on stacking it with the other, but it never happened. No lines. $20 shipped with anything from above. Non-Smoking home, prices include CONUS shipping. I can take further pictures of anything that you are interested in and may even have time tonight to spread out them out. 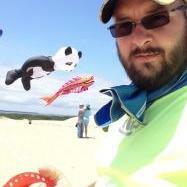 Recommendations for Good Beginner Stunt Kites?